Our old Christmas wreath made from old mince pie boxes has way passed its sell-by date, so it's time to have a new one made. This new one can't be easier; I found an old wire in the tool box (probably taken out from an old hanger) and bent it into a circle, with both ends twisted into small loop then tied with a bendable twist tie wire. 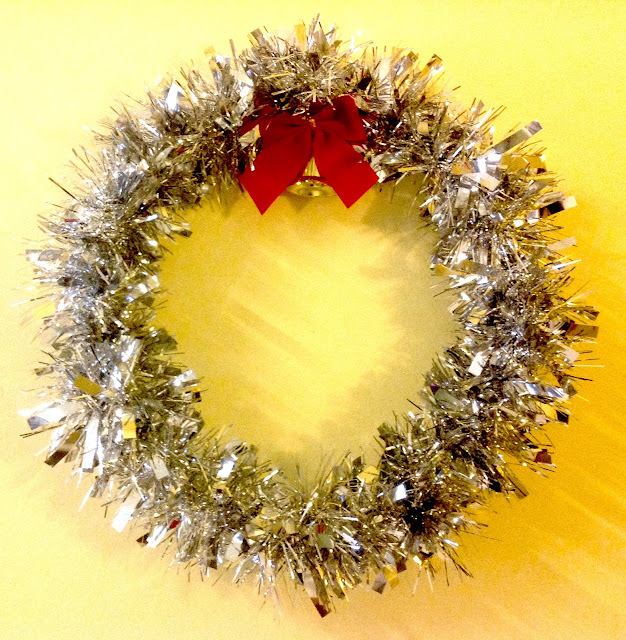 I then twirled the silver tinsel (found in the box with old Christmas decoration) around the wire, secured by twisting the ends together. Finally slapped on a decorative bell and ribbon - again, from the Christmas decor box. Not a single penny was spent. Not even an inch of cello tape. Welcome to the first day of Advent!